Adventures In Uglyworld: Uglyworld #317 - Hold Him Still!!! Uglyworld #317 - Hold Him Still!! !, originally uploaded by www.bazpics.com. 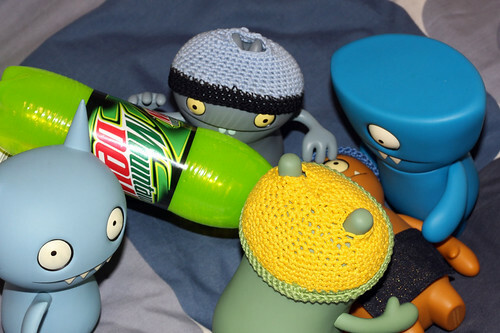 As they nearly reached the bottom of the first bottle of Mountain Dew they could see that it was nowhere near enough to do the job so Babo ordered the others to hold down Wage even tighter so that he could swap the empty bottle for the second full one he had brought along just in case. Ice-Bat was starting to get nervous again but Babo brought his focus back by shouting, "This can only work if we work as a team!!!". As he prepared to change bottles he shouted, "Hold him still!!!" to which the others tightened their grip and held the crazy Wage down with all their might.